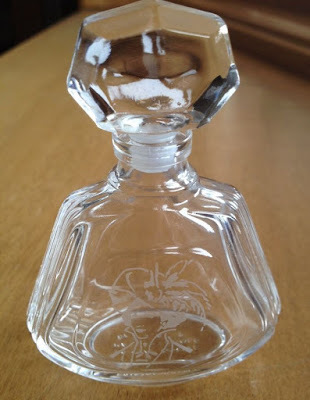 This is an adorable vintage crystal perfume bottle which was made in France. The bottle 's base is marked "Cristal Bottle, Made FRANCE by VCA". There is a beautiful silhouette portrait of a French woman wearing a hat as shown in photo above. It stands at 2 7/8 inches tall with top, and approximately 2 1/2 inches wide.